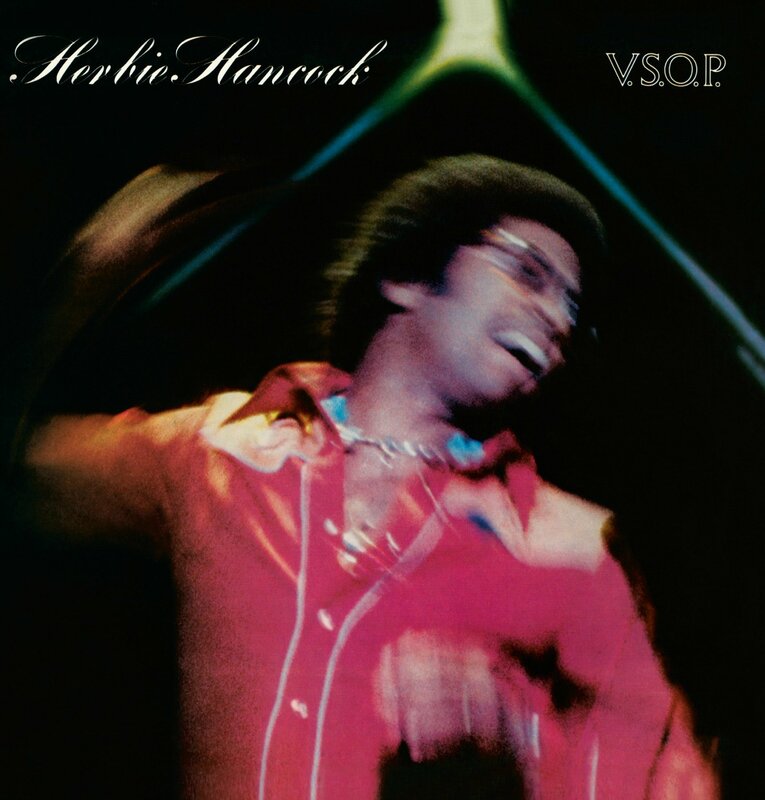 “In the spring of 1976, Herbie Hancock’s manager David Rubinson approached impresario and producer of the Newport Jazz Festival, George Wein, with the idea of staging a retrospective of Hancock’s work. Wein endorsed the idea, so Hancock made a phone call to Miles Davis to ask whether he would do a one-time reunion of the classic quintet with Wayne Shorter, Ron Carter, and Tony Williams. When Davis declined, Hancock invited his long-time Blue Note collaborator Freddie Hubbard to join the ensemble. On June 29, 1976, they took the stage at the City Center in New York and captivated the audience with blistering renditions of “Maiden Voyage,” Wayne Shorter’s “Nefertiti,” and “The Eye Of The Hurricane.” The concert continued with a set of the original Mwandishi Band and was concluded by Hancock’s then current funk band (with the same line-up as on Secrets). It was especially the resounding success of the quintet’s performance, and the 1977 release of this seminal concert, that would have a major impact on Hancock’s later career, effectively ushering in a resurgent wider audience for acoustic jazz. The occasion for these recordings was a special concert presented on June 29, 1976 at New York City Center, by George Wein as part of the Newport Jazz Festival. Originally termed a “Retrospective of The Music Of Herbie Hancock,” its purpose was not so much to pay tribute to one musician, but to enable a group of musicians to get together and play. This was an opportunity to put together some of the finest musicians in the world. I didn’t think it would be possible, but by some miracle it turned out that everybody was available on June 29th, 1976 for the Newport Jazz Festival in New York. The one person whom I consider to be the link between each of the three bands, the one common denominator, is Miles Davis. I really considered the concert to be a tribute to Miles Davis, and this record to be a tribute to Miles Davis. Miles had been recuperating from surgery and hadn’t played trumpet in close to a year, so there was no way he was going to pick up his horn and start playing. That was a physical impossibility. The idea was to bring the past up to date. I had no intention of trying to play like I did, but take music we had played in the early and middle sixties and let the music happen from our contemporary frames of mind. I thought it would be impossible to get people like Tony Williams or Ron Carter or Wayne Shorter or Freddie Hubbard in the same room at the same time, because so many of them are band leaders themselves. Wayne told me later that he hadn’t played that style in years – lots of fast eighth notes and long running flowing lines. This was really straight ahead jazz – walking bass, a swinging drum beat – but expressed through experiences of the musicians today. I thought of the days at Birdland when I used to sit in with Wayne Shorter, Lee Morgan, or Freddie Hubbard. Freddie actually played on my first album, ‘Taking Off’, and then played on ‘Empyrean Isles’ and ‘Maiden Voyage’. I played on Freddie’s albums, and it made logical sense to me to have Freddie Hubbard on trumpet. A strange thing happened when I went on stage with the first group. As we started to play, I got the feeling that no matter what I would play, these musicians were so gifted that they could make music out of anything. The feeling of freedom that came over me was overwhelming. The Sextet that I used to have from 1969 through 1973, played not only the music it had created, but all of the very first music from when I first left Miles Davis in 1968, and got my own band together. The Sextet has a special place in my heart. I was doing the album ‘Speak Like A Child’ and I used flugelhorn, alto flute, and bass trombone as an experiment. The sound killed me so much, I realized, that’s the sound I want for my own band. The most difficult conception to recapture was the Sextet, because of how it was originally built. The Sextet’s very foundation was the intuition, empathy, teamwork, unity, and spontaneous creativity of the members of a true ensemble. From the late sixties until 1973 we had been hanging out together, studying not only music but life. We explored together, trying to analyze the creative process. We grew on each other, we became like one and the music became like one. Billy Hart had to come the farthest. He was working in London with Stan Getz, and the 29th was his one night off. Somehow he managed to fly right from London to New York, rehearse, play the concert and get back on the plane for London. When the Sextet was at its best, the whole group was like a living body. It was a music of the moment, no regular changes, bars or even tempo- but somehow, almost miraculously, the music would have a flow and order that made me feel like I was listening to the sound from all the planets. Trying to recapture that spirit was difficult, but it came off – it was really swinging. I suppose somebody from the twenties or thirties wouldn’t call any of the three groups Jazz. There are people today who don’t call the funk group a Jazz group. I hear that group incorporating jazz and funk into a very happy marriage. The third band is actually my present band. At that time I had been using Ken Nash on percussion, and in addition to Wah Wah, we had Ray Parker on guitar, since he had been recording with us. Of course Bennie Maupin was one of our sextet, and is still playing with me now. The funk band – now that music has such strong roots in the Earth. With all the earthiness there’s always room for flight. The biggest reason I enjoy playing this new kind of funk is the contrast between the wide open improvisation and the funky foundation at the bottom. It gives the music a character that is broad, vast, yet in touch with the people. Recorded live June 29, 1976 by Fred Catero and David Rubinson at City Center, N.Y.C. (as part of the Newport Jazz Festival/New York). – Other versions of “The Eye Of The Hurricane” appear on the albums V.S.O.P. : Tempest In The Colosseum, V.S.O.P. : Live Under The Sky, and Quartet. Yamaha Electric Grand Piano – First produced in the 1970s, the sound of these pianos is produced using hammer and strings in much the same manner as a piano with the addition of pickups under the strings (like the technology used to amplify a guitar). Herbie played this instrument on his 1976 album V.S.O.P. Phase Shifter – This is an effects unit that can alter sound using certain techniques to change the sound waves. While these effects units were originally large boxes with knobs and buttons, today they are most often small pedals used by guitar players. Herbie used the Country Man Phase Shifter on V.S.O.P.